Barry Wilson trained at the Camberwell School of Art and was taught by influential artists such as Bruce Mclean, Cornelia Parker, Jock Mcfadden and Ian Mckeever. Before becoming a full time artist Barry worked in film and television painting scenery and fronting a changing rooms style tv programme called ‘Room Raiders’. As an interior designer, my love of paint finishes and gold leaf lead to my obsession with gold and the techniques that can be applied to it. Barry describes his style: “My style emulates a faint image in an antique mirror or a creased and faded much loved photo. I believe the delicate, fragile beauty of the gold leaf finish belies the somewhat brutal techniques I employ. These include using industrial spray guns, scouring pads and water jets, scrubbing back the layers of paint to reveal the gold leaf base which seems to give the structure/framework of the painting. I believe the result is a vibrant and edgy captured moment; contemporary and beautiful.” . 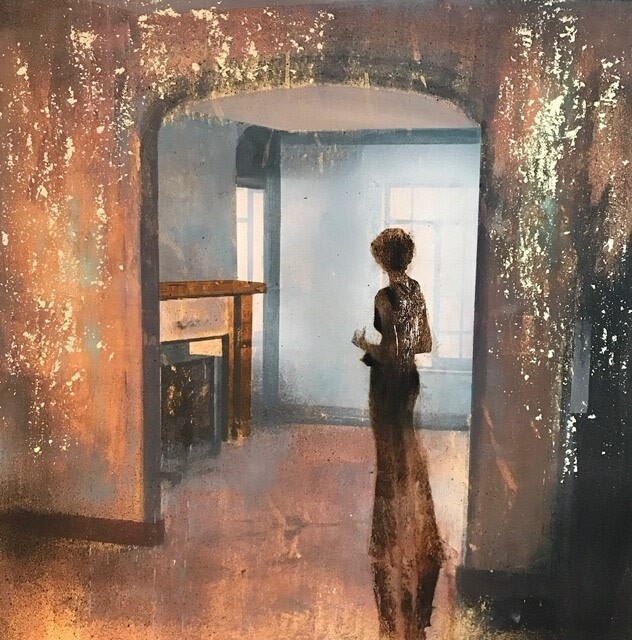 Barry’s highly distinctive paintings have been exhibited in major museums and galleries worldwide with international acclaim, winning the celebrated Saatchi award in 2012.